We hope that you are all training hard for the 2018 Plein Air Easton painting competition. Make sure to apply by January 26th. The Avalon Foundation is pleased to announce David C. Levy as the juror for the Plein Air Easton 2018 competition. 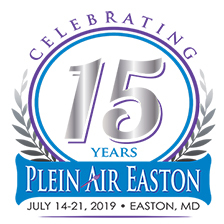 Plein Air Easton is the largest and most prestigious outdoor painting competition in the United States. Each year Plein Air Easton chooses a single person to evaluate hundreds of slides from plein air painters around the world and select the 58 artists who compete in Easton in July. This person becomes the single judge for the event in the following year. Thank you for helping make Plein Air Easton 2017 our most successful year yet! Make sure to save the date for next year's festival. Plein Air Easton 2017 is a wrap, but it's never to late to prepare for next year! It's so hot outside, but there are lots of ways to stay cool at the Quick Draw event this Saturday! Juried Plein Air artist Crista Pisano shares her approach to choosing her subject matter.